If you took Economics 101 in college, you probably at least remember that “supply and demand” is a thing. 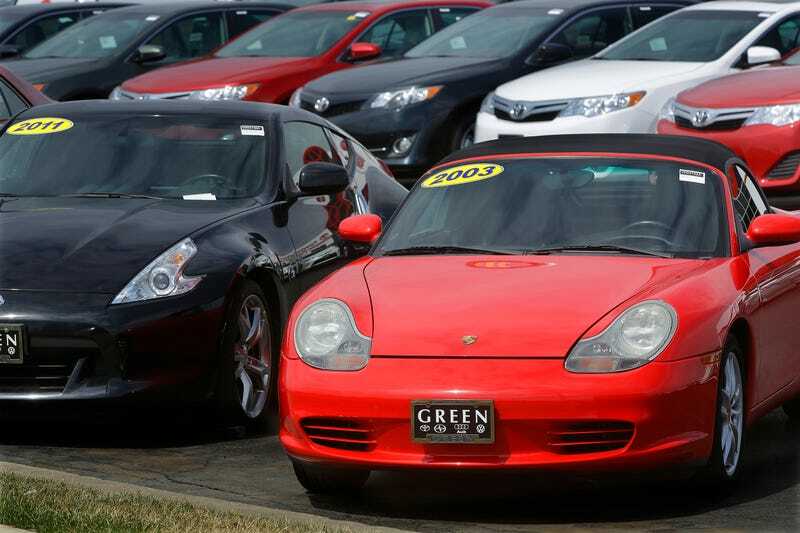 We can see that most basic of market principles on every used car lot in America right now. The market is saturated with pre-owned vehicles, which means prices are down. As such, it’s not such a great time to sell or trade your car. However, if you’re trying to sell something desirable or unique you may be able to skip craigslist hustle and still get a great price. This week’s letter comes from a reader who has a pretty nice BMW, but isn’t sure the best way to get the most money in his pocket. My scenario is that I am looking at doing extensive traveling and I will not be in need of a car for at least 6 months. I bought a slightly used BMW M235i in December for 42k all-in. If I traded in for a lower priced car at a dealership, would they pay cash for the difference in value of the cars? Should I just sell the car? I’m leaning towards selling the car, but I’m not sure the best method for that either. So if you trade the car in for something cheaper, the dealer would cut you a check for the difference. Hypothetically speaking, let’s assume the trade in value of your car is $35,000 and you decide to buy a $25,000 car. In this case, the dealer would cut you a check for $10,000. A private party sale is more likely to get you more money, but will be more of a hassle—especially given the price point you would likely be selling your BMW. Most of your buyers will need financing. While this is not an insurmountable hurdle, you may not have the time or the inclination to wait for the right buyer, haggle with them and navigate the logistics of a financed sale. If you do sell the car to a dealer that doesn’t mean you have to take the first offer you get. As we have said before, CarMax is a great place to start, but they aren’t likely to pay top dollar. I would talk to some local BMW dealers in your area and see who is willing to give you the most money. It’s likely they will all offer about the same, but some stores may have better access to clientele that would want your M235 and therefore might give you a little more for it. The third option is selling your car on consignment. This could be the way to go if you don’t have to sell right away, but want to get the most for it. Some dealers are willing to take a car in on consignment, meaning you still own the car, and get the bulk of the sale, but the transaction is funneled through the dealership, which makes it easier on the buyer. Now consignment sales won’t really work for something cheap or really common like a Honda Accord, but a BMW M235 is a desirable car among BMW enthusiasts especially if it is equipped with a manual transmission. The right buyer may not be local and it is easier to facilitate out-of-state sales at dealerships especially when it comes to financing and transportation. Each dealer will have different fees in regards to what they get out of the sale. At a store like CarLotz, for example, charges a $199 fee to store and advertise the car, and then they get $799 at closing regardless of the sale price. You will have to put in some legwork to see what dealerships handle consignment sales and how their fee structure works. If you think you might try the consignment option, the folks over at Hagerty have some great tips on how to keep your transaction protected. If you choose to sell privately or on consignment pay very close attention to what similar cars are already listing for and price your car aggressively. Keep in mind that your lightly used BMW M235 will be competing against BMW Certified Pre-Owned models. If your price is too close to a CPO car a buyer will likely spend more for the peace of mind of the factory extended warranty. The straight up dealer sale will likely be the easiest way to go, but the consignment option gives you the best of both worlds getting the private party premium, but the convenience of someone else handling the transaction.